Interested in renting Queset House for your event? More information HERE. Do you only require use of 1 room? Request a room HERE. They say that a journey of a thousand steps begins with the first. The Ames Free Library welcomes the Easton community to take that first step into the 21st century world of ever-evolving technology at its newly opened Learning Commons @ Queset House (right side of library driveway). What is a "learning commons"? The Ames Free Library in Easton, Where the Community Connects, is nationally recognized for innovative programs and community service. Awarded the 2011 Library Journal and Bill and Melinda Gates Foundation Grant as a Best Small Library in America finalist, as well the 2013 Massachusetts Innovation Challenge Grant, the library has now opened its doors to a region-wide learning commons that can support the informational needs of the larger community in the 21st century. The Learning Commons, as the expansion is called, is following the lead of such libraries as Darien and Westport, CT, and Skokie, IL, which have pioneered digital media laboratories for their communities. These labs incorporate the philosophy of the 'makerspace' or 'hackerspace' movement, providing an open and accessible venue for people with common interests to meet, exchange ideas, learn, explore, and create within a supportive and technology-rich environment. The mission at the Commons @ Queset House is to create a unique learning hub integrating technology, information, and collaborative expertise that will strengthen lifelong learning opportunities for the Easton community. To create a viable space for information dissemination and creation with the use of new technologies. To foster community partnerships that will enhance and help accomplish the mission. To create flexible spaces conducive to small and large group meetings and adult programming, currently unavailable at the main library. To foster an environment that is open, forward-looking, and responsive to the lifelong learning needs of the community in a world that is dramatically changing. Where is this happening? In most other libraries, such spaces are associated with glass and chrome surroundings, the natural habitat created for anything associated with technology. 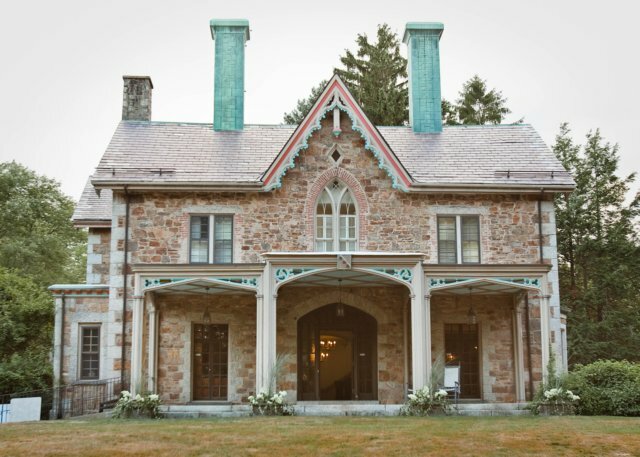 In keeping with the uniqueness of Easton, however, the learning Commons is located at Queset House, the charming 19th century mansion adjacent to the library at 51 Main Street and at the center of historic North Easton. the Library's Board of Directors purchased Queset House several years ago to provide expansion space for its main library, a national historic landmark building designed by H.H. Richardson. The romantic history of Queset House centers around the years Winthrop Ames, a notable Broadway producer, lived there in the 1930's and hosted his New York theater friends. Visitors included such luminaries as Katherine Cornell, George Arliss, and Leslie Howard; the latter is most remembered as Ashley Wilkes in the movie Gone with the Wind. The house is ideally suited to a scalable environment for innovation, as its many rooms can be used for both collaboration and study space, as well as digital silos for different types of learning ranging from podcasting and web creation to robotics and crafting rooms. Each room can also be developed individually as and when funding opportunities arise so that the evolution of the space is incremental and flexible enough to tune into changing community needs. Since its grand opening on Aprill 11, 2014, the Learning Commons is open 47-54 hours a week, following the same schedule as the main library. Open to all, there are two larger, sophisticated conference/meeting rooms ideal for multimedia presentations with mounted 70" high definition television, speakers, projectors, pull-down screens, recording cameras, and seating for up to thirty people in each room. In addition, a digital media room, with access to the resources and equipment needed to make one's own videos, create and manipulate images, transfer VHS recordings to DVD, and much more is freely available. A classic old library room with books dating back to the original 1883 collection is perfect for quiet study, while a smaller informal 'Information Cafe' with comfortable chairs, game tables, and a coffee pot inspires communal study. A 'Makerspace' room hosts the library's popular knitting and beading groups and provides a space for collaborative creation of physical items. The Friends of the Ames Free Library have organized an ongoing book sale room at the back of the house that also accepts donations of good books. The entire building is equiped with public wireless internet access and enjoys air-conditioning in the summer and heating in winter, making it the perfect space for individuals, state representatives, town officials, and community groups to conduct meetings, attend library programs, and learn new skills. Funding to support this unique commons has relied heavily 'on the kindness of strangers.' A generous bequest from Karen A. Carter, former executive vice president of North Easton Savings Bank, provided the catalyst to transform the Learning Commons @ Queset House from a theoretical idea to a practical reality. Income from the Fanny Holt Ames Endowment and the Easton Community Preservation Act funds helped in the installation of an elevator to all levels of Queset House and other renovations critical for handicapped accessibility. The library's bid for a Community Innovation Challenge Grant for 2013, supported by the Town of Easton, was successful and provided funding for the installation of two whole rooms. Corporate funding, individual donations and grants will continue to be strongly pursued toward the goal of completing other rooms in the building. With its classic exterior and tech-savvy interior, the Learning Commons @ Queset House is helping to supply lifelong learning skills critical to the 21st century; significantly expanding and enhancing the existing services provided by Easton's public library to all of its residents.